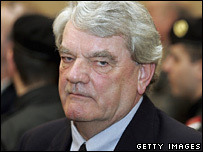 British historian David Irving has had his conviction for denying the Holocaust upheld by the Austrian Supreme Court. But another court has yet to rule on his appeal against a three-year jail term, which he is serving in Vienna. The 68-year-old was imprisoned after pleading guilty at a one-day trial in Vienna on 20 February. During the trial, Mr Irving said he now believed Jewish people had been gassed during World War II. He had previously admitted in court that in 1989, he denied that Nazi Germany had killed millions of Jews. The historian was also on trial for claiming the November 1938 Kristallnacht pogrom, when Nazis attacked and torched thousands of Jewish businesses and synagogues, was not the work of Nazis but of others who had dressed up as stormtroopers. He said Adolf Hitler had attempted to protect the Jews. Mr Irving was found guilty by an eight-person jury. The second ruling, at a regional tribunal, is not expected for at least two months.